← Fourth of July, Family and Birthdays! It’s a very rare quiet moment in our house. Blue Eyes is asleep, Little bug is content in her swing, and even hubby is out cold. The pups are out on a walk with BIL and I have a few minutes in the living room to myself. I was asleep. When little bug and I went to eat, we fell asleep on the bed, but hubby woke us up. So I get the house to myself for a few short minutes. I feel sleep deprived, but not exhausted like I was with Blue Eyes. As I’m sitting here to write, there are a million things calling my name. I have laundry that needs done. Somehow little bug puked on every single swaddling blanket we have. There are still dishes in the sink, which I have been putting off doing all day. I have toys all over the living room, and I don’t even walk into the area I consider hubby’s. His pool table made it into the house one day and that room has been his ever since. But in all the chaos, and unfinished work I feel a few small minutes of peace. Those short moments definitely keep you going. I downloaded a new picture editor. It’s supposed to be really good, but I haven’t quite figured it out yet. So I’ll stick to my old one for the time being. While my family was here, we all went swimming at the neighbors. Okay, they went swimming I held little bug and took pictures of everyone. My little boy is fearless! I mean absolutely not a hint of acknowledgement that he doesn’t know how to swim. He trusts daddy to catch him when he jumps. It’s great for when he does learn to swim, but we missed the lessons by a few days for bug’s birth. I’m hoping there will be some more classes later this summer because I dread him having an accident. Daddy was super good about being right there, but my crazy kid wanted to go down the big boy water slide, and get tossed in the air, and all of those other things moms sit there and pray for. 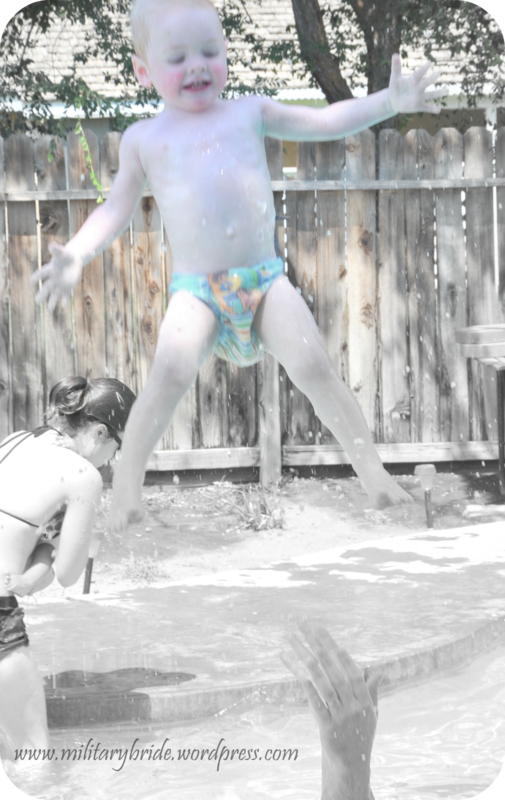 We have a floaty for him, but the day the pictures were taken, my little niece used it. Posted in Baby, blogging, boys, family, girls, hubby, husband, life, motherhood, Uncategorized and tagged babies, baby boy, baby girl, children, crazy kid, husband, kids, life, little bug, milhubby, military, military family, military life, military wife, milspouse, mommy, motherhood, pets, picture editor, rare quiet moment, summer, swaddling blanket, swimming. Bookmark the permalink.